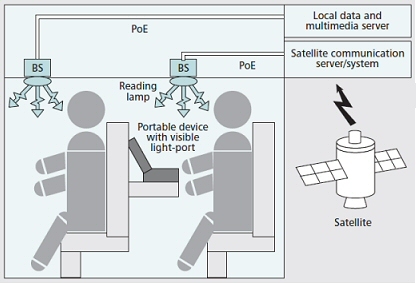 What Is Visual Light Communications (VLC) LED Data? Can LED Lights Be Used For Data? FAQ: LED lighting - can it be used for data? Visual Light Communications (VLC) is a technology that uses LED room lighting to distribute data in the home or office that might otherwise be transmitted by alternative wireless methods, such as WiFi. Your home Internet signal could be transmitted via your lights instead of by wire or radio technology. LED lights by their very nature are solid state electronic devices and can be modulated by a high frequency digital signal that can be used to transmit data locally in a room, without affecting the original intended purpose of illumination. The frequencies used to transmit data are very high and cannot be detected by the human eye. Professor Harald Haas is the course director for the MSc in Signal Processing and Communication at the University of Edinburgh and has been a major proponent of this emerging technology. See his lecture about visual light communications at the TED foundation: "Wireless data from every light bulb"